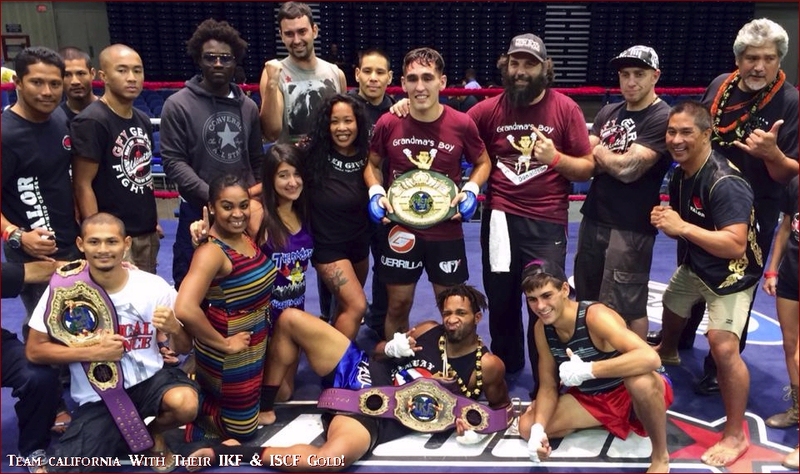 "Bring It On" & "Lets Do THIS" Are Both Fight Sport Trademark of IKF & ISCF Fight Sports! "BAM BAM'S 50th BIRTHDAY BASH"
Ambulance: Medic Ambulance Service, Inc.
defeated Keith Beard (Trabreo Canyon, California, USA, 1-3, 156.8, 5'10", 4-7-74, Bryon Schnell, (949) 735-8414) by unanimous decision 30-26 on all 3 judges cards. Judges Susan Thomas Gitlin, Alan Reyes & Eugene Ray. defeated **Joseph Kropschot (Danville, California, USA, 0-1/1, 180.6, 6'2", 6-19-85, Dan Black, (925) 389-4494) by TKO at break of round 2 & 3. 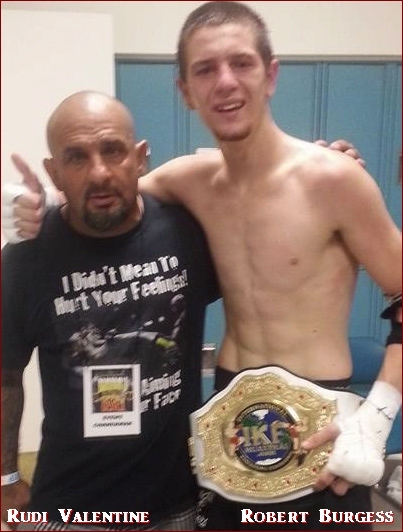 8-30-14: Joseph Kropschot was issued a 45 Medical Suspension by Dr. Mitch Jelen due to TKO until October 14th, 2014. Kropschot was transported to the Hospital for further evaluation. Judge Susan Thomas Gitlin 29-28 Parish & Judges Alan Reyes & Eugene Ray 29-28 Hasslegrave. defeated **Stephen Ladd (Fairfield, California, USA, 0-4, 211.6, 5'9", 11-10-85, Self, (707) 330-6536) by unanimous decision 30-27 on all 3 judges cards. NOTE: This was a special challenge bout by Ladd which is why the IKF allowed it despite the record difference. defeated **Travis Bringle (Sparks, Nevada, USA, 0-1, 178, 5'8", 2-16-80, Brennan Milsher, (775( 560-0069) by unanimous decision 30-27 on all 3 judges cards. defeated ***Jacobe Powell (Van Nuys, California, USA, *1-2/1, (0-2) AMMA: *3-3, PANK: 0-1, 165, 5'7", 9-3-82, Troy Fisher, (818) 272-5653) by head kick KO at 1:22 of round 1. 8-30-14: Jacobe Powell was issued a 45 Day Medical Suspension by Dr. Mitch Jelen due to KO until October 16th, 2014. Jacobe Powell is currently serving a 6 month "False Statement" Suspension until March 1st, 2014. 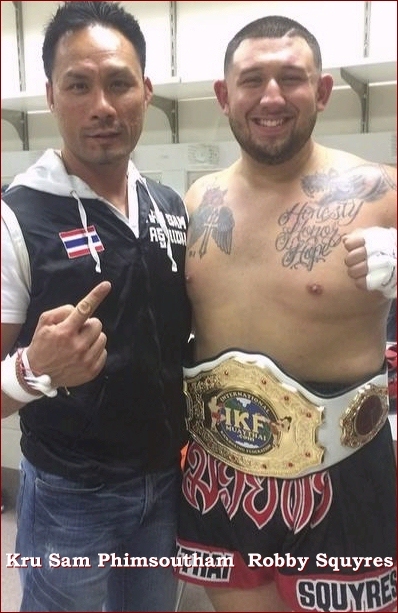 On April 6th, 2014 at the "11th Annual Thai New Year 2014 Songkran Festival" in Hollywood, California, USA Jacobe Powell claimed a fight record of 4-2/3 with a 3-0 "Smoker" bout record and an MMA record of 4-4. Now, on this event, he claimes a record of less Muay Thai bouts (1-1) and less MMA bouts (3-3). IKF has no idea of Jacobe Powell's TRUE record. Due to the skill level the IKF witnessed in his last 2 bouts (Both loses) the IKF will place his actual Muay Thai record at 0-2 until/unless Powell can prove otherwise. Judge Susan Thomas Gitlin 30-25, Judge Alan Reyes 30-27 & Judge Eugene Ray 30-26. Judge Susan Thomas Gitlin & Eugene Ray 50-45 & Judge Alan Reyes 49-46. Judge Susan Thomas Gitlin & Alan Reyes 48-47 Squyres, Judge Eugene Ray 49-46 Harrington. Judge Susan Thomas Gitlin & Alan Reyes 50-45, Judge Eugene Ray 49-46. (*) Weightclass was originally FLYWEIGHT (112.1-117) but was changed due to opponent replacement. (**) Aileen Maquiray's last bout is under review from "Cali 4" April 19th, 2014 - Inglewood, California, USA due to the CSAC judges who were used on the bout. If changed, her record could move to 3-2, which seems likely. IKF has a Jamario Mulder Licensed. Is the same as Jamario Molder aboove? BOTH FIGHTER'S NEED TO GET IKF LICENSED: CLICK HERE. Rodolfo Rosalez NEEDS TO GET IKF LICENSED: CLICK HERE. Steve Ladd NEEDS TO GET IKF LICENSED: CLICK HERE. John (Jake) Hasselgrave NEEDS TO GET IKF LICENSED: CLICK HERE. BOTH FIGHTERS NEED TO GET IKF LICENSED: CLICK HERE. Luke Carter NEEDS TO GET IKF LICENSED: CLICK HERE. Russell Harrington NEEDS TO GET IKF LICENSED: CLICK HERE. Auttumn Norton NEEDS TO GET IKF LICENSED: CLICK HERE. 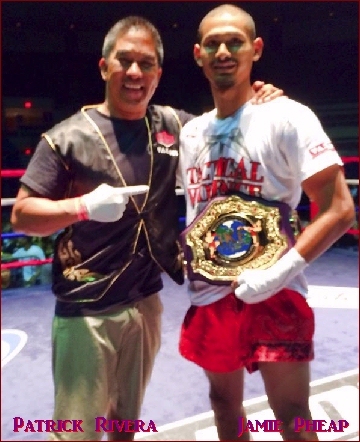 "Battle of The Pacific Championships"
defeated Ikaika Sylva ( Waianae, Hawaii, USA, 0-2, 149.2, 5'8", 3-19-94, Marc Kumai, (808) 548-8737) by unanimous decision, 29-28, 29-28 & 30-27.
defeated Ransen Ranchez (Kapolei, Hawaii, USA, 3-2, 132.9, 5'5", 2-6-97, Ron & Kim Jhun, (808) 234-8668) by unanimous decision, 30-27, 30-28 & 30-27.
defeated John Pheap (Modesto, California, USA, 3-2, 127.7, 5'6", 4-14-88, Pat Rivera, (209) 331-37867) by unanimous decision, 30-26, 30-27 & 30-27.
defeated Marc Talledo (Milpitas, California, USA, 4-6, 130, 5'6", 1-4-87, Rudi Ott, (510) 913-6849) by unanimous decision, 50-43 on all 3 judges cards. defeated Kala'i Kwan (Kailua, Hawaii, USA, 8-3, AB: 1-0, 141.4, 5'10", 6-21-97, Kaleo Kwan, (808) 450-0272) by unanimous decision, 50-45 on all 4 judges cards. defeated Jonah Cadiz (Ewa Beach, Hawaii, USA, 4-2, 132.9, 5'8", 12-4-92, Mike Lal, (808) 781-6787) by TKO at 1:25 of round 3.
defeated Marvelous Tevaga (Wailuku, Hawaii, USA, 2-3, AMMA: *4-2, 172, 5'9", 7-21-85, Brian Joe Crespin, (808) 359-9315) by unanimous decision, 47-45, 48-45 & 47-45.
defeated **Anthony Rivera (Wainae, Hawaii, USA, 3-2, 144.2, 5'10", 12-24-90, Bob Ostovich, (808) 330-2864) by Tap Out due to Kimura at 1:53 of round 1. It was discovered at weigh-ins that Richard Barnard was a Pro Boxer. Click HERE. Justin Kaawa never got his blood work completed. Justin Kaawa has been fined a Promoter reimbursement fee of $250.00 due to the Promoter and suspended 6 months. suspension remains until fine is paid. Kapono Antunez never got his blood work completed. Kapono Antunez has been fined a Promoter reimbursement fee of $250.00 due to the Promoter and suspended 6 months. suspension remains until fine is paid. Craig Boyle defeated Eoin Gibbons by majority decision. 20-20, 20-19, 20-18. Darragh Roninson defeated Luke Boyle by unanimous decision, 20-18, 20-18, 20-18. Ryan Ali (Galway) Defeated Aaron Feerey (Bray) by unanimous decision, 30-27, 30-27, 30-27. Josh Mulhall (Carlow) defeated John Browne (Dublin) by unanimous decision, 30-27, 29-28, 30-27. Jamie O Sullivan (Galway) defeated Joe Coster (Bray) by unanimous decision, 30-28, 30-27, 30-27. Thomas Kleinaitis (Portlaois) defeated Johnny Lyons by majority decision, 29-29, 30-29, 29-28. Jason Mc Guire (Dublin) and Arthur Pokhilo (Dublin) fought to a majority draw, 28-28, 29-29, 29-28. Ross Mc Kiernan (Dublin) Knocked out Ryan Spillane (Cork) in round 3. IKF Ireland has issued a 45 day Medical Suspension for Ryan Spillane until 8th of October, 2014. David Rusinak (Tullamore) defeated Johnny Mc Donagh (Wexford) by majority decision, 37-39, 39-38, 39-38. ALL IRELAND SUPER MIDDLEWEIGHT TITLE. 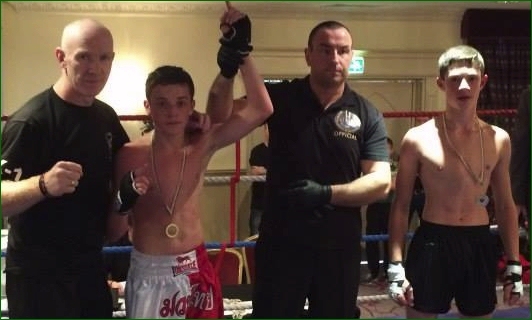 Liam Delaney (Dublin) defeated Vilius Bagdonas (Dublin) by unanimous decision, 50-44, 50-44, 50-44. ALL IRELAND SUPER CRUISERWEIGHT TITLE. 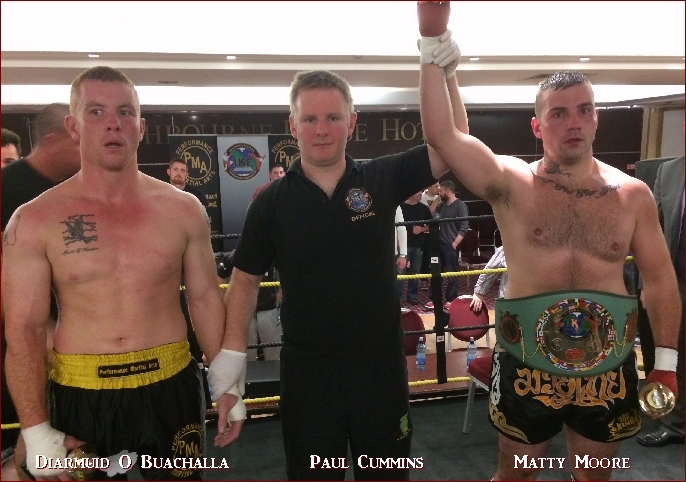 Matty Moore (Carlow) defeated Diarmuid O Buachalla by KO in round two. IKF Ireland has issued a 45 day Medical Suspension for Diarmuid O Buachalla until 8th of October, 2014. Promoter Mick Burke wishes to thank everyone involved in making the night such a success. Defeated Octavio Prado (San Diego, California, USA, 1-1, 138, 5'6", 9-1-87, John Vargas, (614) 315-4456) by Split Decision. Judges: Ren Rathbover 29-28, Supachai Prasertpong 29-28, Vichai Supkitpol 28-29. Defeated Robert Bradley Pellos (San Diego, California, USA, 1-0, 73, 4'10", 11-06-00, Chris Getz, (619) 829-3985) by Split Decision. Judges: Ren Rathbover 28-29, Supachai Prasertpong 29-28, Vichai Supkitpol 29-28. Defeated Moses Sosa (San Diego, California, USA, 0-1, 146.5, 5'9", 5-16-88, Jon Vargas, (614) 315-4456) by K.O 25 seconds in the first round. Referee: Vichai Supkitpol calls the fight after administering an 10 count. Moses Sosa has been issue a 30/45 day "No Training & No Competition" Medical Suspension until October 8th, 2014 or when cleared by doctor. Defeated Kevin Budomo (San Diego, California, USA, 2-5, 146.5, 5'6", 1-23-89, Juan Miranda, (619) 213-7296) by Unanimous Decision. Judges: Ren Rathbover 30-27, Dan Stell 29-28, Supachai Prasertpong 29-28. Defeated Marchello Dominguez (San Diego, California, USA, 0-1, 71, 5'0", 11-16-03, John Vargas, (619) 315-4456) by split decision. Judges: Ren Rathbover 30-27, Vichai Supkitpol 29-28, Supachai Prasertpong 28-29. Defeated Phillip Truong (San Diego, California, USA, 0-2, 153, 5'8", 2-28-81, John Vargas, (619) 315-4566) by Unanimous decision. Judges: Ren Rathbover 29-28, Vichai Supkitpol 30-27, Supachai Prasertpong 30-27. Defeated Alexa Lucida (San Rafael, California, USA, 1-3, 117.5, 5'2", 6-25-91, Carl Gebhardt, (510) 579-6299) by Unanimous decision. Judges: Ren Rathbover 29-28, Dan Stell 29-28, Supachai Prasertpong 29-28. Defeated Robert Soliz (Visalia, California, USA, 1-1, 75, 4'8", 12-9-01, Self, (702) 773-6749) by T.K.O 45 seconds into the second round. Referee: Vichai Supkitpol stops the fight per doctors advice. Robert Soliz has been issue a 30/45 day "No Training & No Competition" Medical Suspension until October 08, 2014 or when cleared by doctor. Defeated Leanardo Soberanis (Escondido, California, USA, 0-1, 157.5, 5'8", 10-27-82, Kru James Stacey, (760) 788-8550) by unanimous decision. Judges: Ren Rathbover 29-28, Vichai Supkitpol 29-28, Supachai Prasertpong 30-27. Defeated Jeremy Shepard (Spring Valley, California, USA, 3-2, 151.5, 5'10", 12-12-94, Carl Gebhardt, (510) 579-6299) by unanimous decision. Judges: Ren Rathbover 30-27, Dan Stell 30-27, Supachai Prasertpong 30-27. 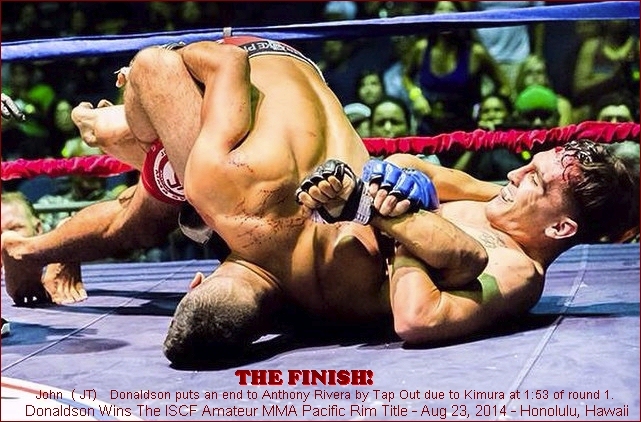 BOTH FIGHTERS Need To Be IKF Licensed - Click HERE. Marvelous Tevaga Needs To Be IKF Licensed - Click HERE. (**) Anthony Rivera Needs To Be ISCF Licensed - Click HERE. (**) John (JT) Donaldson IS ISCF Licensed: CLICK HERE. Jonah Cadiz Needs To Be IKF Licensed - Click HERE. 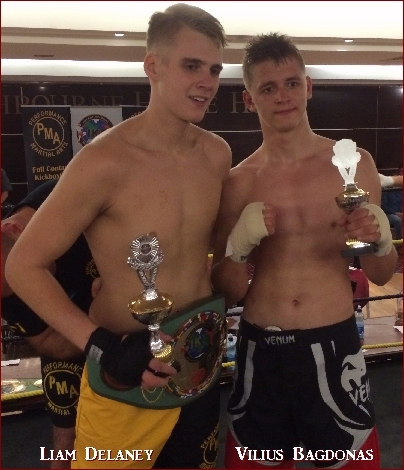 BOTH FIGHTERS NEED A JUNIOR AMATEUR FIGHTERS (AGES 8-17) PARENTAL RELEASE FORM - Click Here. Kala'i Kwan Needs To Be IKF Licensed - Click HERE. Enriquo Abadilla Needs To Be IKF Licensed - Click HERE. 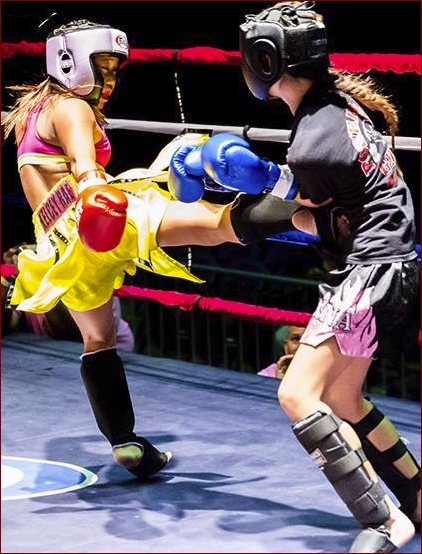 "IKF Point Muay Thai Kickboxing Tournament"
WHAT: IKF/PKB Point Muay Thai / Kickboxing - Semi-Contact - No Knockouts! 12 oz (Juniors) and 16 oz (Adults) Boxing Gloves. Excellent Experience for all skill levels and ages. Men, Women and Children Compete Separately. And The ONLY "Sanctioned" Semi Contact Kickboxing Organization In California! BOTH FIGHTER'S NEED TO HAVE FULL PHYSICALS: CLICK HERE. BOTH JUNIOR FIGHTERS NEED TO HAVE AT WEIGH-INS A Junior Release Form: CLICK HERE. Alexa Lucida NEEDS TO GET IKF LICENSED: CLICK HERE. ALEXA LUCIDA NEEDS TO HAVE A FULL PHYSICAL: CLICK HERE. Dara Ahmadina NEEDS TO HAVE A FULL PHYSICAL: CLICK HERE. Dara Ahmadina NEEDS TO GET IKF LICENSED: CLICK HERE. "Pro / Am Muay Thai"
defeats **Edger Pelayo (Perris, California, USA, 2-2-1, 125, 5'8", 12-11-95, Mike Sarkissian, (951) 288-5239) by Unanimous Decision. Judges: Kim Kongkriangkai 30-27, Ruben Rowell 30-27, Vitchai "Rex" Supkitpol 30-27.
defeats **Dustin Shaw (Los Angeles, California, USA, 3-3, 144.8, 5'9", 2-25-86, Roxy Richardson, (213) 840-5185) by Split Decision. Judges: Kim Kongkriangkai 30-27, Ruben Rowell 30-27, Vitchai "Rex" Supkitpol 28-29.
defeats **Joshua Caldwell (Norco, California, USA, 2-2, 175.9, 6'2", 6-8-91, Jason Caldwell, (702) 477-5842) by Unanimous Decision. Judges: Kim Kongkriangkai 29-28, Ruben Rowell 29-28, Dan Stell 30-27.
defeats **Christine Connor (Los Angeles, California, USA, 3-1, 159, 5'8", 7-26-89, Edmond Taverdyan, (818) 213-2338) by Split Decision. Judges: Kim Kongkriangkai 28-29, Ruben Rowell 29-28, Dan Stell 29-28.
defeats **Seferino Ramos (Sylmar, California, USA, 5-3, 142, 5'6", 12-19-91, Luis Reyes, (818) 312-2215) by Unanimous Decision. Judges: Kim Kongkriangkai 29-28, Ruben Rowell 30-27, Vitchai "Rex" Supkitpol 29-28.
defeats Amanda De Rosa (Victorville, California, USA, 2-4, 124.6, 5'7", 6-22-90, Craig Buchanan, (760) 885-6745) by Unanimous Decision. Judges: Kim Kongkriangkai 30-27, Ruben Rowell 30-27, Vitchai "Rex" Supkitpol 29-28.
and Dennis Mendez (Burbank, California, USA, 2-1-1, 157.8, 5'7", 12-21-80, Daniel Gutierrz, (818) 397-9293) fought to a Majority Draw. Judges: Kim Kongkriangkai 29-27, Ruben Rowell 28-28, Vitchai "Rex" Supkitpol 28-28.
defeats Antonio Arango (Lemon Grove, California, USA, 4-2, 149, 5'9", 8-21-84, John Vargas (619) 315-4566) by Unanimous Decision. Judges: Kim Kongkriangkai 29-28, Ruben Rowell 30-27, Dan Stell 29-28.
defeats Marie Choi (Irvine, California, USA, 5-6-1, 114.6, 5'5", 7-2-78, Collin Oyama, (714) 803-4977) by Unanimous Decision. Judges: Kim Kongkriangkai 40-36, Ruben Rowell 40-36, Vitchai "Rex" Supkitpol 39-37.
defeats Lyle Joe Davis (Costa Mesa, California, USA, 4-3/2, 154.5, 6'1", 4-4-76, James Smith, (803) 556-8537) by TKO end of first round. Referee: Dan Stell stops the fight at the end of the first round, due to swelling of the right ankle. Lyle Joe Davis has been issued a 180 day "No Training & No Competition" Medical Suspension until February 12, 2015 or when cleared by doctor. (**) IKF has no idea of Jacobe Powell's TRUE record so as of this date, his record is 1-1.
defeats Jordan Harris (Palmdale, California, USA, 6-2/2, AMMA 0-2, AB 8-1, 124.8, 5'7", 3-22-89, Felipe Ramos, (661) 435-9681) by Unanimous Decision. defeats Jay Alvarez (Inglewood, California, USA, 14-4/4, 135.1, 5'8", 11-10-87, Rod Mckiver, (310) 844-3921) by Unanimous Decision. IKF Judges: Mick Burke, Joe Wilson, John Quigley, Patrick Ryan and Nicola Collins. 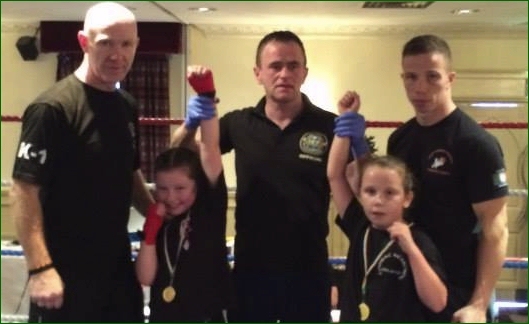 The IKF Sanctioned show in the Menlo Park Hotel on Sunday, 17 August was yet another resounding success for the hosts, Galway Black Dragon Kickboxing Club. The show started at 4.15 pm and finished at 7.15 pm on the button. The house was full, the music was great, the bar was busy and the fight fans were treated to FREE finger food. However, the main attraction of the event was the 18 fights! There were several different styles on offer such as Light Contact, Full Contact, White Collar Boxing and K-1. The officials were on the money, the atmosphere was great and everybody was buzzing at the show and certainly after the show. From a promoters point of view, "It couldn't have ran smoother." Said Pete Foley. "Sure there were a few cancellations from up the country (I wouldn't want to fight my fighters either lol) and some adjustments to the fight card here & there but all in all, a great night of combat and camaraderie with all concerned." When the show finished, the ring was taken down and loaded back into the van & trailer and everyone was chillin out at the bar by 8PM. Foley continued, "A huge word of thanks to all who helped set the show up & down from building the ring to door staff & security to MC & DJ, Glove Runners, corner staff, weight control crew, Judges, Referees, Timekeeper, Menlo Park Hotel management & Staff, fighters from home & away, coach's etc, etc and anybody else who helped put it all together." There were some class fights including a few wars with some of the more experienced fighters. The novice division fighters proved they are a serious crew of cadets coming through the ranks and they are looking to take over. Also a few cracking juniors who entered the squared circle for the first time ever and they were all brilliant - win lose or draw. "I couldn't be a prouder coach." Paul Huish from Black Dragon took on Dermot O Rourke from Top-Pro in Kilkenny in the main event and what a finale it was! Both men looked in great shape and put on a first class show which was well appreciated by the fight fans. Huish showed his class and took a unanimous decision and will now go forward to fight for the IKF European Super Lightweight K-1 Title in September in Galway. Another fantastic fight was between Black Dragon fighter Marc Mc Gettigan and David Milewski from Ken Horans club. Milewski started at a breakneck pace and had Marc backed up for most of the first round, but Marc weathered the storm and clipped Milewski with a right hook to the body which took some of the wind out of his sails. On instructions from his corner, Marc took the centre in round two and forced Milewski on the backfoot and made it a round apiece. In round three, Marc caught his game opponent with some crunching shots and forced a count. When the action resumed Marc was calm and picked his shots well dropping Milewski again for a count. At this point the writing was on the wall. Although Milewski got up and fought on, Marc sensed a finish and picked up the pace even more, dropping him yet again. At this stage the referee had seen enough and called it off giving Marc victory by TKO. 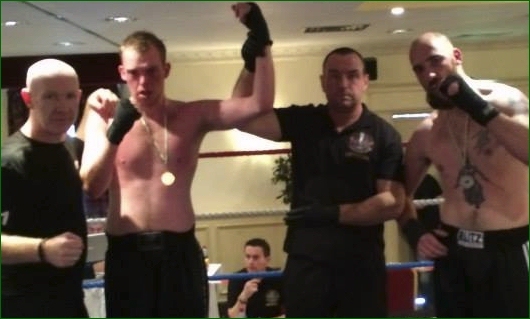 Another stand out fight was between Jamie O Sullivan from Black Dragon and Mateusz Deren from Mountmellick. Both men stood at least 6'3'' tall and both had great range in their shots but it was Jamie's left Jab that did the trick. He landed it at will, knocking back Derens head each time. After a very physical and entertaining contest, the decision went in favor of O Sullivan. James Kelly from Black Dragon took on Kyokushinkai fighter Julius Byrne from Dave Kings club in Galway and this was another cracker. James gave away over four kilos in weight to Byrne but his talent came to the fore and he took a well deserved win. John Walsh and Gary Elbert, both from Black Dragon went at it under White Collar Boxing Rules and this was another classic. Elbert took the win on this occasion but in fairness to Walsh, he gave away six kilos in weight. Cian Mc Cormack from Black Dragon beat Charlie Kennedy from Carlow Top-Pro on points. Leona Trautt was on fire against a very game Sarah Murray from Kildare. Murray took some serious shots but enough was enough in the third round and her corner quite rightly threw in the towel giving Leona yet another win by TKO. Eight years old Faith Foley from Black Dragon got the win over Rihanna Lynch from Dungarvan and Faiths club mate Chloe Corcoran scored a draw with Sophie Delaney from Mountmellick. Chloe Collins from Black Dragon also scored a draw with Carlow Black Dragons Millie Walker. Connor Power from Dungarvan defeated Adam Walsh from Galway, 20-19, 18-20, 20-19. Chloe Corcoran from Galway drew with Sophie Delaney from Mountmellick, 20-20, 19-19, 20-18. Faith Foley from Galway defeated Rihanna Lynch from Dungarvan, 20-19, 20-19, 20-20. Alicia Chambers from Tipperary defeated Aisha Ikeje from Mountmellick by withdrawal. Wesley Ward from Galway defeated Damien Creavin from Galway, 20-18, 20-18, 20-18. Billie Maher from Carlow defeated Shannin O Dwier from Tipperary by withdrawal due to injury. Gary Elbert from Galway defeated John Walsh from Galway by unanimous decision, 29-28, 29-28, 30-27. Chloe Collins from Galway and Millie Walker from Carlow fought to a majority draw, 20-18, 19-19, 19-19.
defeated Brendan Creaven (Galway, Ireland, 1-1, 112kg, 188cm, 9-12-86, Pete Foley, 087 8119227) by referee stoppage in round two. 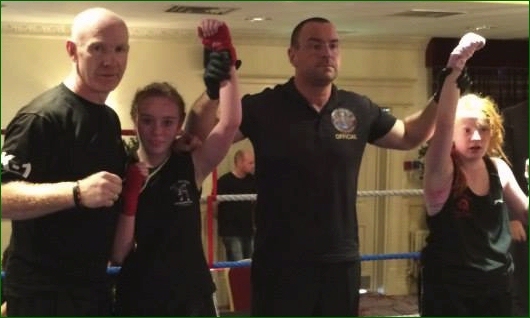 defeated Sarah Murray (Kildare, Ireland, 2-2-3, 61.1kg, 5-30-89, Vinnie Murphy, 087 9080922) by TKO in round three. IKF Ireland recommend a 30 day medical suspension for Sarah Murray until 17 September, 2014. Jack Power from Dungarvan defeated Alex Fitzpatrick from Galway by unanimous decision, 30-27 on all 3 judges cards. defeated Mateusz Deren (Mountmellick, Ireland, 1-1, 91.9kg, 6'3'', 8-16-86, Tommy Delaney, 085 1158606) by majority decision, 30-29, 29-29, 30-29.
defeated Eoin Maher (Carlow, Ireland, 0-2, 59.6kg, 5'9'', 5-3-97, Dermot Maher, 085 7180587) by corner withdrawal in round one. defeated David Milewski (Galway, Ireland, 3-4-1, 72.1kg, 177cm, 10-18-83, Ken Horan, 087 2596559) by TKO in round three. IKF Ireland recommend a 30 day medical suspension for David Milewski until 17 September, 2014. Saoirse Joyce from Galway and Megan Lennon from Dungarvan fought an exhibition match. defeated Julius Byrne (Galway, Ireland, 0-1, 57.1kg, 5'8'', 11-3-99, Dave King, 085 7801873) by unanimous decision 29-27, 29-27, 30-26.
defeated Charlie Kennedy (Carlow, Ireland, 3-4, 61.4kg, 5'10'', 9-1-98, Dermot Maher, 085 7180586) by split decision 29-28, 30-27, 28-29.
defeated Dermot O Rourke (Kilkenny, Ireland, 6-5-2, 64.5kg, 12-17-76, Paul Cummins, 085 2441538) by unanimous decision, 40-37, 40-36, 39-37. Pete Foley, James Kelly, Referee Mick Burke & Julius Byrne. Pete Foley, Jamie O Sullivan, Referee Mick Burke, Mateusz Deren. IKF AMATEUR MUAY THAI - WEIGHT? defeated Ambrose Salami (Chatham, UK, 3-1, 72.5kg, 5'10", 6-4-92, Matt Simms, 0044-791244536) by 3rd round TKO. AMBOSE SALAMI HAS BEEN ISSUED A 30 DAY MEDICAL SUSPENSION UNTIL AUGUST 27th, 2014.
defeated Nathan Emery (Chatham, UK, 4-1, 80.4kg 6'1", 9-4-96 Matt Simms, 0044-791244536) by majority decision, 48-47, 47-48, 49-47.
defeated Sam Nicholls (Luton, UK, 7-5-3, 72.5kg, 5'10", 1-19-90, Amir Subassic, 0044- 7917688660) by 3rd unanimous decision 30-27,30-27, 30-27.
defeated Ben Mitchell (Hastings, UK, 1-2-1, 62kg, 5'10", 8-24-96, Phil Eaton, 0044-7739390911) by Majority decision, 28-29, 29-28, 28-29.
defeated Stephanie Mullins (Brighton, UK, 1-1, 53kg 5'2", 3-29-90 Nick Brewer, 0044-7872610645) by unanimous decision, 30-26, 30-26, 30-26.
defeated Mitch Neale (Hailsham, UK, 0-2, 65kg 5'9", 6-21-98 Matt Braybrook, 0044-7792758970) by unanimous decision, 28-29, 28-29, 28-29.
defeated Mike Crud (London, UK, 1-1, 75kg, 6'1", 2-20-91, Elijah Johnson, 0044 07446918986) by 3rd round KO. MIKE CRUD HAS BEEN ISSUED A 45 DAY MEDICAL SUSPENSION UNTIL SEPTEMBER 12th, 2014.
defeated Aaron Coldman (Harmondsworth, UK, 5-1, 73kg, 5'10", 9-12-86, Billy Gallup, 0044-7939037659) by majority decision 29-28, 29-28, 28-29.
defeated Sarah Ballesteros (Bexhill, UK, 3-2, 62kg, 5'4", 3-18-84, Matt Braybrook, 0044-7792758970) by unanimous decision 28-29, 27-30, 28-30.
defeated Micheal Burman (Hastings, UK, 1-2, 62.2kg, 5'6", 2-7-92, Andy Chambers, 0044-7739390911) by 3rd round TKO. MIKE BURMAN HAS BEEN ISSUED A 30 DAY MEDICAL SUSPENSION UNTIL AUGUST 27th, 2014.
defeated Micheal Allan (London, UK, 1-1-1, 95.8kg, 5'10", 3-30-81, Elijah Johnson, 0044-7739390911) by 3rd round KO. MICHEAL ALLAN HAS BEEN ISSUED A 45 DAY MEDICAL SUSPENSION UNTIL SEPTEMBER 12th, 2014.
defeated Robin McCoy (Milton Keynes, UK, 2-2, 67.7kg, 5'10", 3-11-88, Raymond Leigh, 0044-7709777535) by majority decision 28-28, 29-28, 29-27.
defeated Micheal Aupy (Bournemouth, UK, 0-1, MMA 0-2, Boxing 0-0-1, 86kg, 6'1", 10-26-87, Jimmy Johnson, 0044-7856461437) by 2nd rd TKO. MICHEAL AUPY HAS BEEN ISSUED A 30 DAY MEDICAL SUSPENSION UNTIL AUGUST 27th, 2014.
defeated Oliver Fribbens (Arundel, UK, 0-1, 69.4kg, 5'10", 8-21-92, Nick Brewer, 0044-7872690645) by unanimous decision 29-28, 29-28, 29-28.
defeated Jamey Taylor (Port Talbot, UK, 4-3, 59kg 5'8", 1-8-86, James Wallis, 0044-7837630084) by unanimous decision 29-28, 29-28, 30-27.
defeated Guy Sampson (Hastings, UK, 0-2-1, 77kg, 6'1", 4-29-83, Andy Chambers, 0044-7739390911 by 3rd round TKO. GUY SAMPSON HAS BEEN ISSUED A 30 DAY MEDICAL SUSPENSION UNTIL AUGUST 27th, 2014. 8-10-14: Anthony Bueno is NOT IKF Licensed. Bueno came in 12 lbs overweight at the 8 Limbs Fight Promotions "Muay Thai Global" August 9th, 2014, Sacramento, California, USA. Bueno and his trainer have been suspended and fined a promoters reimbursement fee of $100 which is due and payable to the event promoter. (**) Vinton Yu came in underweight of the 95 lb minimum. Daniel Pothmann has been issued a 60 day no Contact Training & 60 Day No Competition Medical Suspension due to a cut on his lip until October 10th, 2014. WINNER: Charles Morales by TKO at 1:16 of round 2. Joseph Morales has been issued a 30 day no Contact Training & 30 Day No Competition Medical Suspension until September 10th, 2014. Gabriel Saldivar NEEDS TO HAVE FULL PHYSICALS: CLICK HERE. Gabriel Saldivar MUST HAVE A VALID AND LEGAL COPY OF THEIR BIRTH CERTIFICATE AT WEIGH-INS. 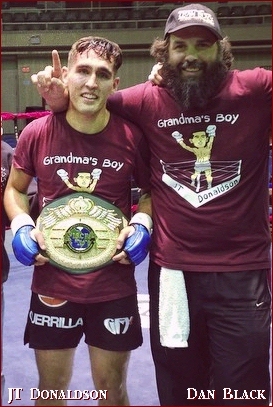 (**) If Gabriel Saldivar has a Birth Certificates That Proves he is OVER 8 Years Old - This Will Be A REAL BOUT. 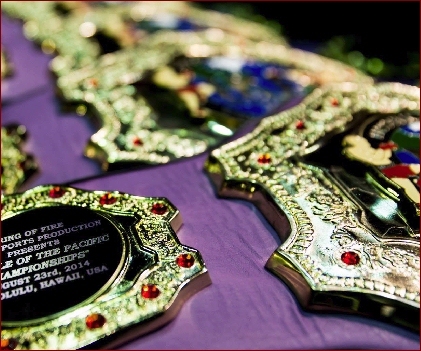 (**) IKF already has required info & Full Physical from 2014 IKF World Classic. Domingo Will still need Junior Release Form and will still need to become IKF CA Licensed. BOTH JUNIOR FIGHTERS NEED TO HAVE FULL PHYSICALS: CLICK HERE. BOTH JUNIOR FIGHTERS MUST HAVE A VALID AND LEGAL COPY OF THEIR BIRTH CERTIFICATE AT WEIGH-INS. BOTH FIGHTERS NEED TO HAVE FULL PHYSICALS: CLICK HERE. BOTH FIGHTERS MUST HAVE A VALID AND LEGAL DRIVERS LICENSE OR LEGAL ID AT WEIGH-INS. Liz Swaby-Clacken NEEDS TO HAVE A FULL PHYSICAL: CLICK HERE. Billy Brand NEEDS TO HAVE A FULL PHYSICAL: CLICK HERE. Victoria Engberson had physical from 2014 IKF World Classic. HOWEVER: Still needs to become IKF Licensed. Star Monroe NEEDS TO HAVE AT WEIGH-INS A Junior Release Form - CLICK HERE. "IKF Point Muay Thai / Kickboxing Tournament"
The MMA Evolution Expo is almost here as the weekend of August 23rd and 24th nears. 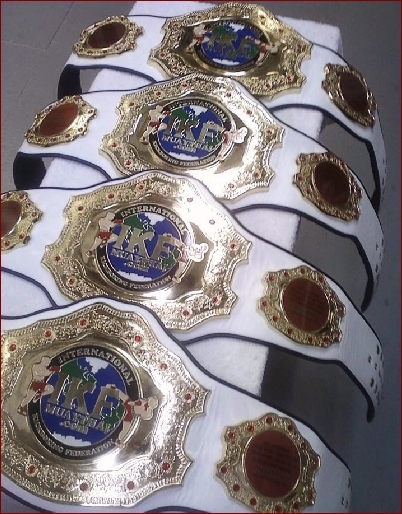 The IKF Kickboxing Fights that will be held on Sunday, August 24th will be on fire! The IKF Kickboxing Fight card will be loaded with tons of great bouts between Men, Women and Junior fighters! Among the approximate 15,000 fans that attend the weekend of events, we are expecting a great crowd to witness the best standup action as fighters will be going for the knockout! Fight fans, get your tickets now! Ticket are on sale at local gyms in San Diego and will also be available on Saturday and at the door on Sunday at the San Diego Convention Center! Doors open at 1:PM and fights Start at 2:PM! Come early to get the best seats in the house! Even greater news is that those purchasing the $35 Kickboxing tickets in advance and $40 at the door for Sunday's show will also be able to get into the Expo on Sunday with the same ticket and see all the other action! The Outstanding Mr. Wayne Wilson, well known in Northern California for announcing sporting events will take center stage to bring the fighters to the ring for battle! 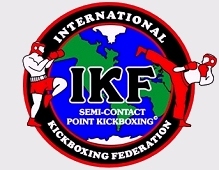 There will also be another chapter of IKF Point Kickboxing on Saturday, August 23rd. There are no knockouts in the IKF Point Kickboxing competition but the action is fast and furious as men, women and juniors show their skills in Muay Thai Kickboxing action! Spectators can also call in their credit card to order tickets in advance at (843) 773-1005 or by e-mail to johnnyd@akpromotions.org Your Tickets will be at the Will Call at the Door on Sunday. Credit cards will also be taken at the door. We may still accept a few more matches for the full contact with the right available and ready participants. For more information on the Full Contact Kickboxing Fights, contact Johnny Davis at johnnyd@akpromotions.org or call (843) 773-1005. More information on The MMA Evolution Expo, contact Mr. Gabe Scarpelli at (619) 333-0153. Defeats **Ben Nolasco (Anaheim, California, USA, 0-1, 123.2, 5'5", 4-29-86, Nam Phan, (714) 814-4383) by Split Decision. Ben Nolasco has been issued a 30 day NO CONTACT and 30 Days No Competition Medical Suspension until 9-02-14 by Dr. due to loss of hearing in right ear. Judges: Kim Kingkriangkai 30-27, Supachai Prasertpong 30-27, Marcus Guevara 30-27.
defeats **Drew Maxwell (Downey, California, USA, 0-1, 162.8, 5'11", 10-21-90, Rick Rodriguez, (562) 309-5982) by TKO 27 seconds in the 3rd round. Drew Maxwell has been issued a 30 day NO CONTACT and 45 Days No Competition Medical Suspension until 10-15-14. Judges: Kim Kingkriangkai 30-27, Vichai Supkitpol "Rex" 29-28, Marcus Guevara 30-27.
defeats **Chad Kindle (Lancaster, California, USA, 0-2, 189.8, 6'1", 1-3-90, Sumpan Boonsook, (661) 816-3161) by Unanimous Decision. Judges: Kim Kingkriangkai 30-26, Vichai Supkitpol "Rex" 29-27, Marcus Guevara 30-26. Judges: Supachai Prasertpong 29-28, Vichai Supkitpol "Rex" 29-28, Marcus Guevara 29-28. Judges: Vichai Supkitpol "Rex" 29-28, Supachai Prasertpong 29-28, Marcus Guevara 28-29.
defeats **Omar Castro (Rialto, California, USA, 0-2, 143, 5'10", 7-15-90, Uchenna Anyikam, (714) 924-4195) by Split Decision. Judges: Vichai Supkitpol "Rex" 29-28, Supachai Prasertpong 30-27, Marcus Guevara 28-29.
defeats **Garik Mitchell (Simi Valley, California, USA, 1-1-1/1, 146, 6'1", 8-22-89, Victor Melendez,(818) 484-6114) by TKO 1:16 in the 3rd round. Garik Mitchell has been issued a 30 day NO CONTACT and 45 Days No competition Medical Suspension until 10-15-14. Winner: Joseph Vidal: Split Decision 29-28, 30-27, 28-29. Winner: Evan McCall: Unanimous Decision 30-27, 30-27, 30'-27. Winner: Lorenzo Hunt Guillotine at 1:30 of round 1. Winner: Issiah Washington TKO at 1:39 of round 1. Byran Hart has been issued a 30 day Medical suspension until September 2nd, 2014. Winner: Amy Haines Unanimous Decision 29-28, 30-27, 29-28. Winner: Donovan Roberston TKO at 1:39 of round 1. Jason Leiger has been issued a 30 day Medical suspension until September 2nd, 2014. Winner: Thomas Manning Arm Triangle at 2:59 of round 1. Winner: Hugo Acero Unanimous Decision 29-28, 30-27, 29-27. Winner: Zach Elkins TKO at 1:11 of round 2. James Sanders has been issued a 30 day Medical suspension until September 2nd, 2014. Winner: Collin Luberts Triangle Choke at 2:28 of round 2. Winner Dominic Jones Tap due to Strikes at 2:59 of round 1. Parris King has been issued a 30 day Medical suspension until September 2nd, 2014. Winner: Seth Dupis at 44 seconds of round 1. 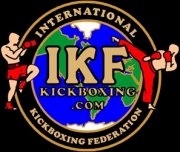 IKF Event Referee: Vichai Supkitpol "Rex"
(**) Jose Tendilla NEEDS TO HAVE AT WEIGH-INS A Junior Release Form - CLICK HERE. (**) Paola Ramirez Previously informed the IKF her Date Of Birth was 12-10-85. However, sent in as 12-10-89. Which is correct? Keith Beard has submitted all required medical work and is cleared to fight. (**) Diente White NEEDS TO HAVE AT WEIGH-INS A Junior Release Form - CLICK HERE. Jonas Menken Previously informed the IKF his Date Of Birth was 11-6-82. However, sent in as 11-16-82. Which is correct? PAST IKF NEWS - CLICK HERE!